As the summer winds down and I head back to school, I have been thinking a lot about how I want to make this year different. Make it count. Make it matter. And be more focused and intentional about cultivating that reading community from the start. 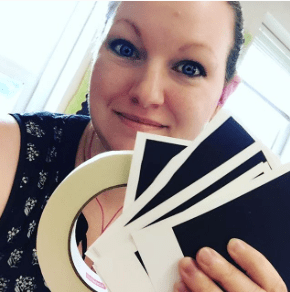 So today I’ll share some thoughts about how to really develop a strong community of readers before school starts, on that first day, and in those first few weeks. Make sure I have scheduled time every day for them to read and for me to read to them. From the very first day. And treat those times as sacrosanct. Make sure they can see themselves in our classroom library. On recent episode (#28 if you want to scroll back in your feed and listen) I talk about the diversity audit that my students did to analyze the books in our library. And over the summer, I have been working on adding a better variety of titles. When I dust off those shelves and put those books in those genre bins and select some enticing titles to feature face out, making sure those books are as diverse as my class and as diverse as their world is crucial. Create those displays that will get them excited about the reading they’ll do this year. In the hallway right before they enter our room, they’ll pass this giant #ClassroomBookADay display that I have been diligently working on. A big shout out to Lori Lewis in the #ClassroomBookADay Facegroup group who shared (for free!) this cool display of polaroid picture templates for each of the 180 books we’ll be reading this year. So I have been cutting and trimming and measuring and tapping and it’s an impressive display and a promise of what’s to come. And as in year’s past, I also create a “My Reading Life” display for the door where I showcase covers of some recent reads and some all-time favorites. And eventually that will be turned over to my students for their own displays. And of course I always have my own “Mrs. Allen is Currently Reading….” chalkboard display. 1. Get to know my students as much as possible. Pronounce their names correctly, start to learn their interests and passions and strengths. And start to build that trusting relationship. Because if I am going to ask them to open themselves up and take risks as readers (and writers!) this year, they have to know that I care about them and want to know their authentic self. 2. I want them excited to come back. Gone are the days when I used to start with an extensive review of the syllabus and grading procedures and setting up the rules. Nope. We are having fun. There will be music and movement and an engineering challenge. And at least one read aloud – probably two! And a chance for them to do some book tastings and exploring what’s available in our classroom library. And – some down time when they can dive into those books and start to build back up that stamina for focused independent reading. During those first few weeks is when that classroom culture of reading really starts to emerge as routines and relationships are established. Within that first week, I like to give a reading survey to get a sense of their likes and attitudes about reading. This is also really important because a carefully crafted survey can give you great data when you compare the answers to those questions at the end of the year. I used to give a paper one but now I use a Google Form. If you want to take a look at a really good sample, Pernille Ripp has a great one on her site that I will link to for you. But don’t dismiss the power of casual conversation about books during those snippets of time throughout the day like arrival and dismissal and in the hallway. Absolutely share what you are reading but that authentic reading community happens when kids can share with each other their thoughts and feelings and reactions (both good and bad) to that book they brought home last night. A huge part of fostering that reading culture is providing engaging and authentic ways for kids to talk about the books they are choosing to read. The days of me assigning a diorama of Hatchet or a cereal box craftivity about Wonder are done. So instead, we’ll have book clubs, we’ll write blog posts and share them with a real audience, we’ll use WeVideo to do booktalks and post them on a YouTube channel, we’ll Skype with authors and other classes for the Global Read Aloud, we’ll create #BookSnaps of our favorite parts, and we’ll tweet our favorite lines and tag the author and cross our fingers for a response! And – most importantly – we’ll do even cooler things that are ideas my students bring with them! So – I am so so excited for fantastic year of reflecting and growth and learning with my students and with you. I would love to know how you launch your school year to cultivate a community of readers. You can tag me on Twitter or Instagram – our handle is @books_between or email me at booksbetween@gmail.com . I would love to hear from you. Today I am really really excited to welcome Celia C. Pérez to the podcast. She is the author of the recently released middle grade novel The First Rule of Punk. We chat about her inspirations for the novel, zines, and The Wizard of Oz! 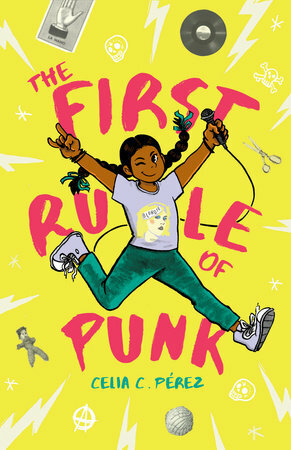 Your debut middle grade novel, The First Rule of Punk, has been getting all kinds of buzz – everyone is talking about this book! I just cannot wait for the world to meet Malú. Can you tell us a bit about this girl – and a bit about her story? And what was your process like for creating the zines that are in The First Rule of Punk? When Malú and her mom move to Chicago, one of the first things they do is scope out and find the neighborhood coffee shop and the neighborhood library. What was your childhood library like? There is this tension between Malú and her mother about how to dress and behave. She thinks her mom wants her to be this ideal Mexican-American “senorita” and Malú want to dress in a more edgy style. Did you feel that cultural tug-of-war in your own family? I noticed this recurring thread of The Wizard of Oz in the book! I was so intrigued by Malu’s worry dolls – can you tell us a little more about them? So, I have to ask…. cilantro or no cilantro? What were some of the challenges with writing this book? What’s next for you – do you think you’ll stick with middle grade? Okay – that wraps up our show this week. If you have a question or an idea about a topic we should cover, let me know. You can email me at booksbetween@gmail.com or message me on Twitter/Instagram at the handle @Books_Between. Thank you so much for joining me this week. You can find an outline of interviews and a full transcript of all the other parts of our show along with all of our previous episodes at AlltheWonders.com. And, if you are liking the show, please help others find us too by telling a friend, sharing on social media, or leaving a rating on iTunes or Stitcher.